His Beatitude, IGNATIUS IV, Patriarch of Antioch and all the East presided at the Divine Liturgy at St. Nicholas Cathedral of Brooklyn, NY on October 21, 2012. This was the highlight of his short visit to the United States. The Patriarch, accompanied by His Eminence, Metropolitan PHILIP and His Grace, Bishop NICHOLAS (who celebrated the liturgy), arrived about 10 am on a warm autumn day as the church bells filled the streets around the Cathedral. The Cathedral Dean and Vicar-General of the Archdiocese, Archpriest Thomas Zain, greeted the Patriarch at the door of the vestibule and presented the Patriarch with the Gospel book to venerate. As His Beatitude made his way down the center aisle of the Cathedral, scores of people reached out to him for his blessing as the chanters, led by seminarian Rassem El-Massih, chanted the 9th ode of the Palm Sunday Canon, "Blessed is He who comes in the name of the Lord . . . . " After blessing the faithful, the Patriarch ascended the throne, the priests took his blessing and vested for the liturgy as Orthros continued with the Patriarch leading the chanting of the Katavasias. Before the reading of the Epistle, Fr. Thomas intoned the Patriarchal Phimi, "IGNATIUS the most devout and most holy father, chosen by God, Patriarch of Antioch, the great city of God . . . . . May God grant him many years!" 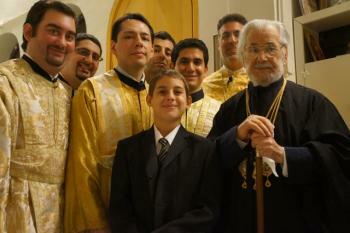 The Phimi was then chanted in Arabic by Metropolitan PHILIP and the chanters. After the reading of the Gospel, His Eminence, Metropolitan PHILIP welcomed the Patriarch and the delegation from the University of Balamand who accompanied him on the trip and other members of the Archdiocese Board of Trustees who were in town especially for the visit of the Patriarch, including Vice-Chairman, Mr. Fawaz El-Khoury. At the end of the Divine Liturgy, the Patriarch addressed the faithful and then gave the final blessing as Rassem chanted the Polychonion of the Patriarch. A special collection was taken from the Brooklyn community of both St. Nicholas Cathedral and St. Mary Church of Bay Ridge Brooklyn to help the Patriarch minister to the victims of the ongoing civil war in Syria. More than $15,000 was raised in the special collection and will be given to the Patriarch. This was indeed a special day as we welcomed the head of our Antiochian Patriarchate and Church. May God continue to give him strength and grant him many years!